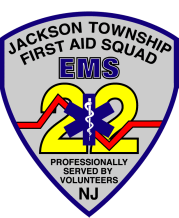 The Jackson Township First Aid Squad is always interested in recruiting new members to serve our town as Emergency Medical Technicians and drivers. Throughout its sixty-year history, the men and women of Jackson First Aid have tirelessly served our community, volunteering thousands of hours to help their neighbors in their time of need. Active and Probationary members serve one duty night a week, from 6pm to 5am, and then Saturday and Sunday night on every fifth weekend. Training is provided to all members. The first step is to fill out an application and drop it off at the Squad building. You will then be contacted for an interview. Interviews are generally conducted at the Executive Board meeting the week before our general membership meeting. After your interview, you will be sent for a background check and drug screening. Then you will be able to begin running as a member of the Squad. Click here to download information for prospective members. Click here to download the background check form.